VitrA Memoria Tall Basin Tap£462.40 inc.VATRRP: £578.00 (Save 20%)Tall basin tap for washbowls and countertop bathroom sinks, its taller height allows for worktop-mounted basins. VitrA Memoria 3 Hole Basin Tap£442.40 inc.VATRRP: £553.00 (Save 20%)Central spout and separate hot and cold handles, mounted on a chrome back plate for basin deck mounting. 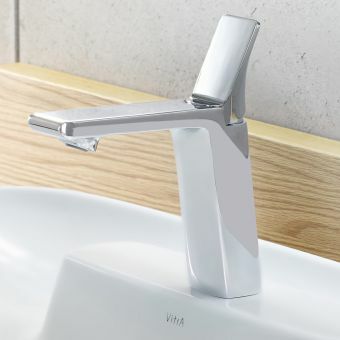 VitrA Memoria Wall Basin Tap£456.00 inc.VATRRP: £570.00 (Save 20%)Wall mounted bathroom sink mixer tap. 2 handles and 1 spout mounted on a chrome back plate. VitrA Memoria Lever Handle Wall Basin Tap£472.80 inc.VATRRP: £591.00 (Save 20%)Wall mounted tap with lever handle & spout, Red Dot Design Award winner by French designer Christophe Pillet. Hansgrohe Metris 110 Basin Mixer TapFrom £175.50 inc.VATRRP: £270.00 (Save 35%)Smart, reliable basin mixer tap. Options of: CoolStart, Low Flow or standard mixer with Hansgrohe's QuickClean. Hansgrohe Talis S Single Lever Basin Mixer Tap£178.75 inc.VATRRP: £275.00 (Save 35%)Featuring AirPower for a voluminous spray, a swivel spout and quality chrome plating which is easy to clean. Hansgrohe Metris 100 Basin Mixer TapFrom £137.15 inc.VATRRP: £211.00 (Save 35%)Efficient little mixer tap with a smooth lever operation, compact 89mm spout ideal for cloakrooms. Hansgrohe Focus 190 Tall Basin Mixer Tap From £126.76 inc.VATRRP: £195.00 (Save 35%)Tall basin mixer tap with options for a waste, and an eco option to save water. Ideal for countertop installation. Hansgrohe Logis 210 Swivel Basin Mixer TapFrom £157.31 inc.VATRRP: £242.00 (Save 35%)Single lever basin mixer with a smooth easy to use handle and swivel spout for greater functionality. Hansgrohe Metris S 100 Basin Mixer TapFrom £178.75 inc.VATRRP: £275.00 (Save 35%)Single lever operation. Available with or without waste, and LowFlow water saving model. Hansgrohe PuraVida 110 Basin Mixer TapFrom £315.25 inc.VATRRP: £485.00 (Save 35%)iF product design award winner! Available in either stylish white or polished chrome finish, with 2 waste options. At UK Bathrooms, we stock a selection of bathroom products and accessories from top quality designers and manufacturers. 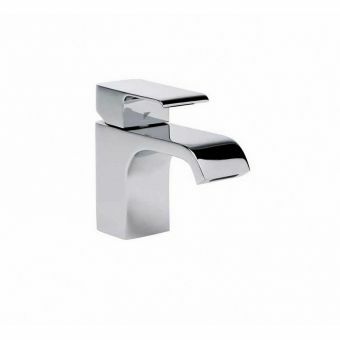 The range consists of both modern and traditional basin mixer taps for you to choose from. It is easy to find something suitable for your bathroom, as there are many price ranges and designs to browse through. Free delivery is available on some of our items to save you even more money. Francis Pegler Pulsar Deck Handles are a pair of deck handles in a chrome finish that provide a sleek and modern design. Suitable for usage with a Peglerfill Combined Filler Overflow, they go well in contemporary bathrooms and have a minimum operating pressure of 0.5 bar. One of the more expensive products within this range is the Bristan 1901 Basin Mixer with Pop-up Waste. You can choose from two different finishes to complement your bathroom – chrome or gold. 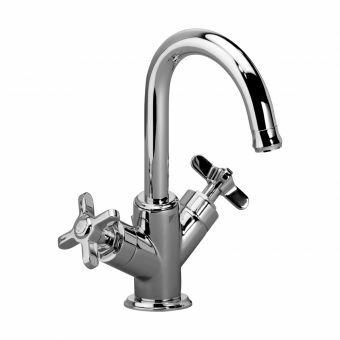 Another excellent product is the Sagittarius Plaza Monobloc Mixer Tap with Pop-up due to its high-pressure capacity and modern design. 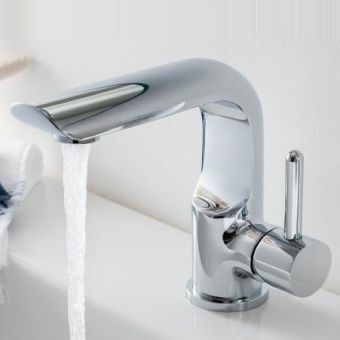 This tap is compact and simple, allowing for easy control of pressure and hot and cold water flows. The pop-up waste feature provides outstanding functionality and aids with the cleaning process. This is a must for any stylish home. We aim to dispatch orders as quickly as possible, as we pride ourselves on an efficient service. Our couriers are fast, reliable, and trusted, delivering your goods in perfect condition. We provide a range of payment options, including 0% finance on certain products for your convenience. 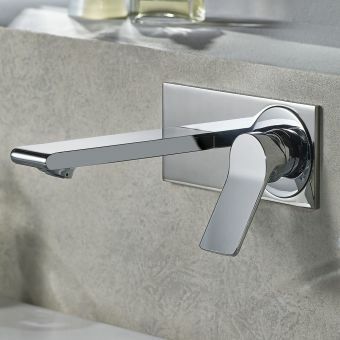 Welcome to ukBathrooms' buyer’s guide to basin mixer taps. There are two main types of tap - pillars and mixers. Pillars are two separate taps - one hot and one cold. Mixers blend the hot and the cold water before it comes out of the tap. 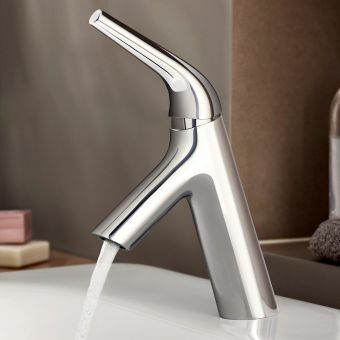 This buyer's guide gives you the full rundown on mixer taps, the different varieties available, the leading manufacturers and how you can purchase them from ukBathrooms. 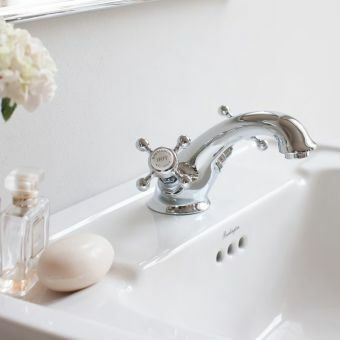 When planning your new bathroom, it may sound strange to advise that you pick the taps first. Surely selecting the bath, the sink and the separate shower unit is more important? 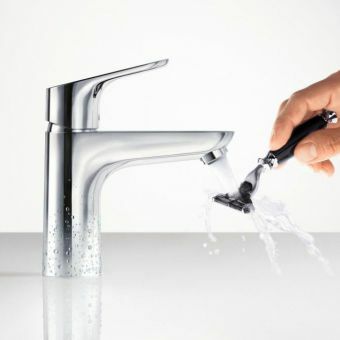 Aesthetically you'd be correct, but if you set out with one type of tap in mind and want to change it just after the bath or the sink is installed, that could mean extra time, money and frustration, because adjusting the plumbing to the new type of tap may not be as straightforward as you might think. If you're reading this buyer's guide, you may have already chosen the type of bathroom basin you would like. If you've made your choice, now it's all about opting for the tap that goes best with your selection. 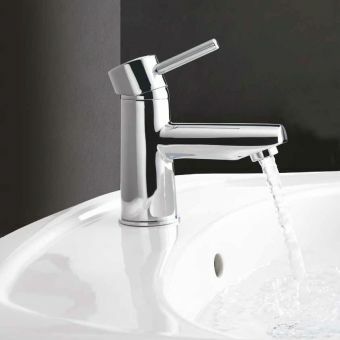 At ukBathrooms, we've got an amazing range of 360+ basin mixer taps to choose from. This guide is all about explaining the choices you have with us and the variations of basin mixer taps. We'll also be showcasing some of our top basin mixer taps from leading suppliers, including Hansgrohe, Grohe, Crosswater, Burlington, Imperial and Dornbracht. 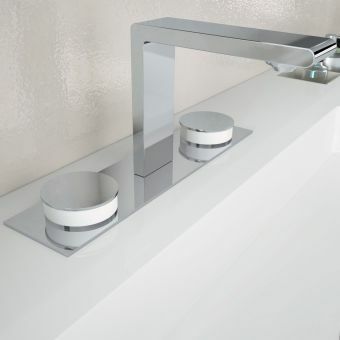 There's lots of different options for you to choose from for your basin mixer taps at ukBathrooms. Let's run down some of the main features on offer. Most standard mounted taps are attached directly to the basin. 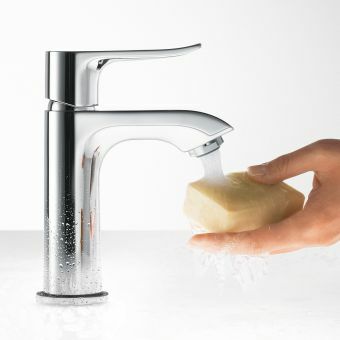 Tap holes are normally pre drilled or pre formed in the basin, in some cases mostly with German basins, the tap holes are half cast out on the underside and your plumber “taps out” the holes as required, any half proficient plumber should be familiar with this procedure when installing European items. 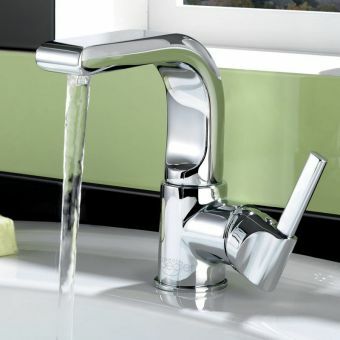 Wall mounted taps are considered by many in the industry as the more contemporary style of basin mixer tap. They’re screwed on to your bathroom wall with all the plumbing hidden behind the tiles. It looks very stylish and is supremely easy to clean. 2. 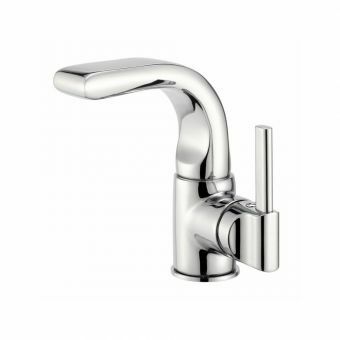 What is the style of the tap? Traditional basin mixer taps are reminiscent of earlier bathroom designs, going back to Victorian, Regency or Edwardian aesthetics. They are characterised by generous curves, ornate handles and the occasional juxtaposition of porcelain with stylish, reflective chrome. 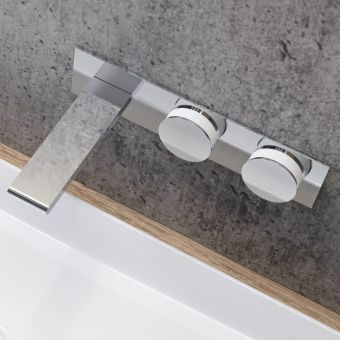 Contemporary basin mixer taps have an elegance and minimalism that remind you of a look that can both incorporate the spirit of the white heat of technology from the 1960s to futuristic, contemporary sleek lines and flat handles. One hole basin mixer taps, sometimes referred to as monobloc mixer taps, have their controls and their spout together on one unit. 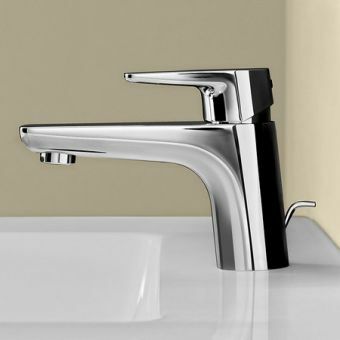 The variety of styles of one hole basin mixer taps is very wide. Here's an example of a traditional style - the Burlington Birkenhead Monobloc Basin Mixer Tap - and here’s a contemporary example - the Crosswater Essence Mini Basin Monobloc. 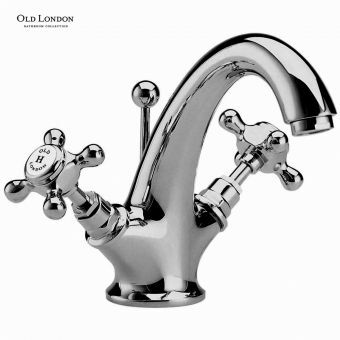 Two hole basin mixer taps are your standard one hot and one cold tap, more traditional but always a guaranteed style classic with plenty of choice. 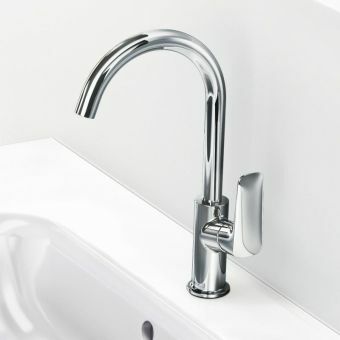 Click here to see a Burlington Birkenhead H Type Basin 2 Hole Mixer Tap. Three hole basin mixer taps have two separate controls (one hot, one cold) and the spout in between. Very elegant and simple to use. 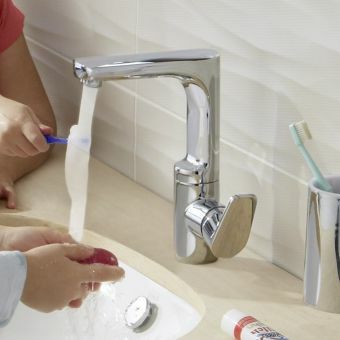 With waste means that your basin mixer tap has a control that can lift the plug up in the sink to let any standing or running water escape into the plughole. 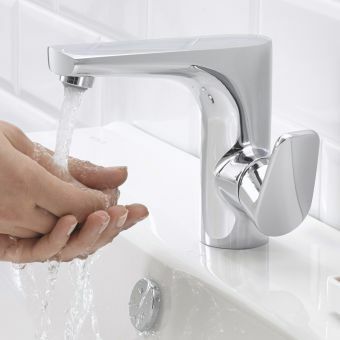 Without waste basin mixer taps have no control. With these, you need to purchase a separate basin waste. Digital basin mixer taps feature full thermostatic controls to save energy, and ensure safe temperature limits. These digital units are operated completely electronically with many featuring wireless controls. 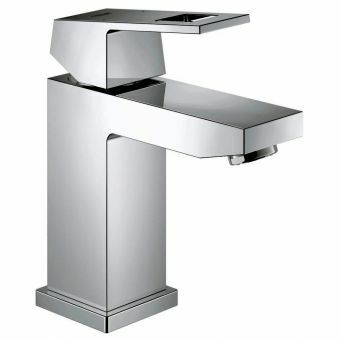 Non-digital basin mixer taps are referred to as standard. The market for standard units is currently much larger than the one for digital. That said, given the growth in our sales of digital units, it would not surprise us to see mass-market acceptance for digital some time in the not too distant future. 6. What are the sizes available to you? 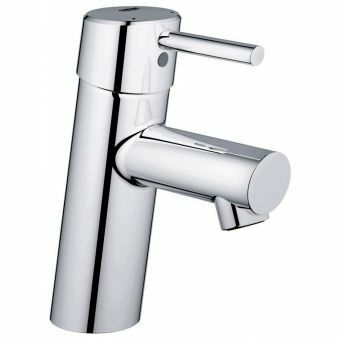 Standard size basin mixer taps are designed for normal bathroom installations in houses and offices. Easy to use and incredibly familiar, there's a great choice available for you here at ukBathrooms for your new bathroom at home. Mini mixers are for really small rooms in the home where space is at a premium - for example, a wash basin for a downstairs toilet. 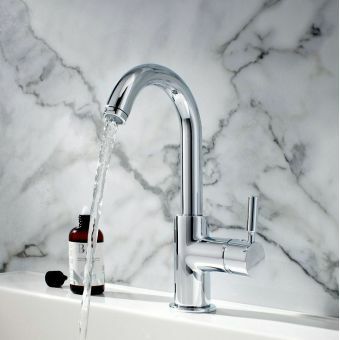 Big on style, small on space - check out this Tavistock Blaze Basin Mixer Tap as a great example. 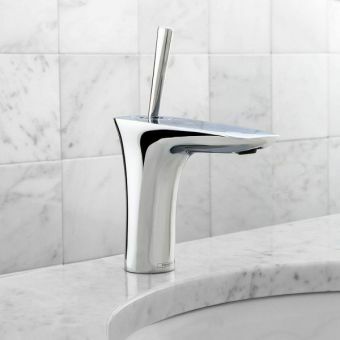 Tall taps are great for countertops. The height of these tall taps is striking. Combined with their great looks, it adds an extra depth to the style you're setting out to achieve. 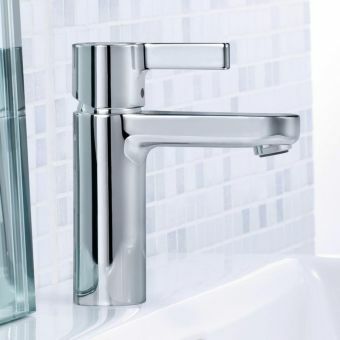 Check out this Hansgrohe Focus Tall Basin Tap - it's one of the range of tall taps available at ukBathrooms. Bathroom pioneers since 1901, Hansgrohe's quality and heritage shines through in the beauty, reliability and ergonomics of its product range. Renowned for high-class workmanship, Hansgrohe's design ethos is "form and content from a single source - clever minds, powerful concepts and new forms". 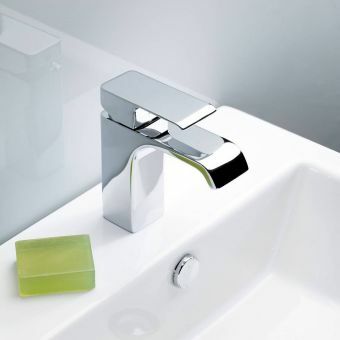 ukBathrooms currently stock 62 sensational taps and mixers from Hansgrohe - click here to check out the entire range. 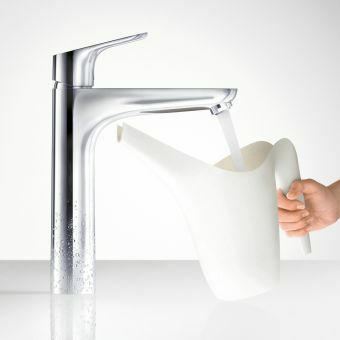 Hansgrohe have recently recruited famed designer Philippe Starck to their ranks. Together, they’ve recently launched his Axor Stark Range. Burlington, based in London, takes its inspiration from 19th century British design. They have brought to the market a stunning and complete collection of traditional-style bathroom products. Their range features four eras - classic, contemporary, Victorian and Edwardian. Burlington's taps and mixers perfectly mesh their aesthetic ethos with the latest in cutting-edge technology. 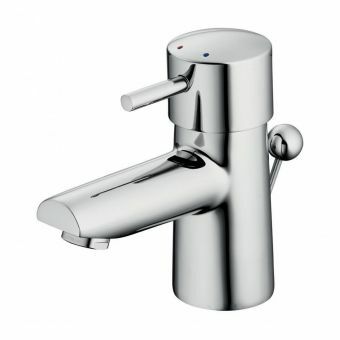 There are 110+ taps & mixers currently available at ukBathroom. Crosswater is also available here at ukBathrooms. Established in 1998, chairman David Hance speaks of his company with pride, stating "Crosswater’s offering is second to none. We offer a complete bathroom solution." 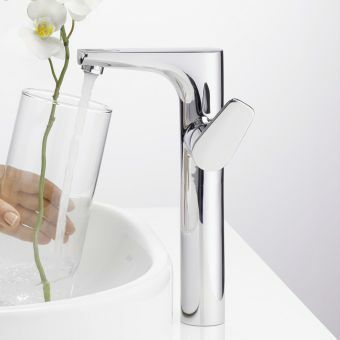 Kelly Hoppen has recently launched her Zero Range through Crosswater. Noted for their distinctive style encompassing the simply elegant to the truly extraordinary, begin your voyage of discovering into Crosswater's range by clicking here. Roper Rhodes, established over 30 years ago and based in the historical city of Bath, describes their products as "functional, stylish and seamlessly put together...in a wide variety of colours, materials and finishes". Buy everything Roper Rhodes from ukBathrooms at the very best prices. 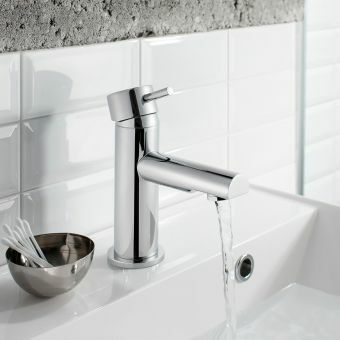 To see just how stylish their basin mixer taps are, check out our listings page by clicking here. 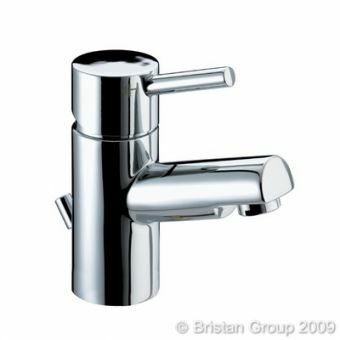 Since their mission started in the early 1980s, Bristan has grown to become the biggest showers and taps company in the UK. They estimate that one in five UK homes has a Bristan shower or tap fitted. Their products are designed by their own in-house specialist team to the very highest of quality standards. 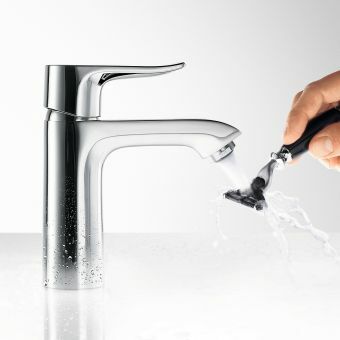 German bathrooms giant, Grohe, whose motto is "Pure Freude An Wasser" ("The Joy Of Water" in English), has been responsible for countless new design-driven, award-winning and innovative bathroom fittings. The Grohe team cast, electroplate, assemble, sand and finish their own products meaning they're in complete control of quality at all points. 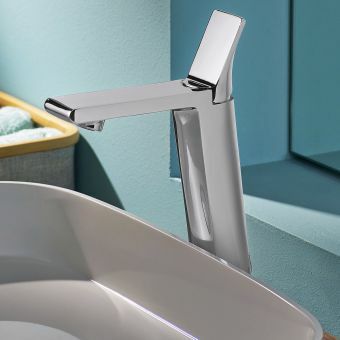 Their focus is on classic aesthetics remodelled in a contemporary style - you can see this for yourself by clicking here to go to ukBathroom's Grohe range. "Style and quality for kitchens and bathrooms - Francis Pegler offers both in abundance - design excellence across a range of price points." Pegler products offer no compromise in quality and have a firm focus on energy efficiency. Pegler were one of the first manufacturers in the UK to gain BS5750 certification for Quality Assurance and they've since been awarded the prestigious BS EN ISO 9001:2000. 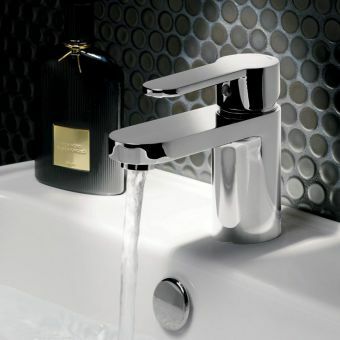 Click here to see the Pegler basin tap mixers in stock at ukBathrooms - a superb mix of traditional and contemporary. 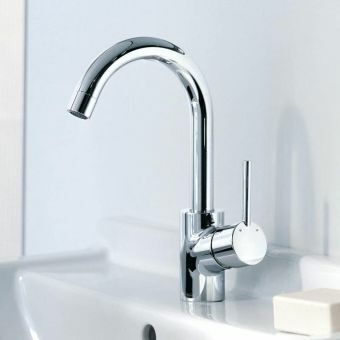 Make sure you visit Keuco's basin tap mixers selection at ukBathrooms. Keuco's mission statement for their customers is to provide products of "elegant design, enduring quality and functional durability". Their designers have a passion for aesthetics and possess an extraordinary attention to detail. Everything is precision engineered so that the style and flair of the product is matched by the ingenuity of the design and assembly. Click here to see Keuco's range at ukBathrooms. We're passionate about bathrooms. We’re all about making you feel bright, refreshed & energised in the morning. In the evening, help you relax and unwind. Quality is never an issue we compromise on when supplying you with the perfect bathroom, whatever the amount of space you have.